Caught By Uniform - Jersey-Assisted Catch or Single? 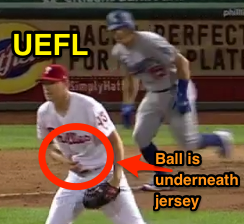 A batted ball lined into a pitcher's jersey during Monday night's Dodgers-Phillies game, ruled a catch and out by HP Umpire Brian O'Nora proved most impressive, yet left one key question: what is the difference between a ball in the uniform and a legal catch? Pivetta's shirt catches Barnes' line drive. 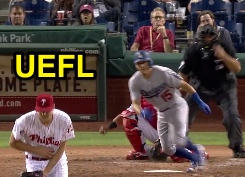 The Play: With two out and none on in the top of the 6th inning, Dodgers batter Austin Barnes hit a first-pitch fastball from Phillies pitcher Nick Pivetta on a line drive toward Pivetta's midsection, the Phillies pitcher spinning around in reaction to the careening comebacker. Replays indicate that as Pivetta spun, the batted ball found a hole in the placket of Pivetta's uniform shirt, and snuck inside as Pivetta reached for the ball with his right hand. Pivetta then reached inside his shirt to retrieve the baseball, ruled an out on the catch. A catch is the act of a fielder in getting secure possession in his hand or glove of a ball in flight and firmly holding it; providing he does not use his cap, protector, pocket or any other part of his uniform in getting possession. In short, if the ball bounces off a fielder's person (think of a ball bouncing off Bartolo Colon's stomach), and he subsequently gloves it, that is a legal catch, even though the ball technically "touched" the uniform. If the player, however, actively uses his uniform to help gain possession, that is not a legal catch. The difference to consider is whether the ball touched the uniform/cap/pocket or whether the player used the uniform/cap/pocket to get possession. Is there a penalty or remedy if a fielder does "use his cap, protector, pocket or any other part of his uniform in getting possession?" Rule 5.06(b)(4) has limited applicability: "Each runner including the batter-runner may, without liability to be put out, advance...(B) Three bases, if a fielder deliberately touches a fair ball with his cap, mask or any part of his uniform detached from its proper place on his person. The ball is in play and the batter may advance to home base at his peril; (C) Three bases, if a fielder deliberately throws his glove at and touches a fair ball. The ball is in play and the batter may advance to home base at his peril; (D) Two bases, if a fielder deliberately touches a thrown ball with his cap, mask or any part of his uniform detached from its proper place on his person. The ball is in play." Though 5.06(b)(4)(A)-(D) imposes penalties and awards for detached equipment, this is not such a case: the shirt was not deliberately placed so as to touch a ball in play, and it certainly wasn't thrown. Brian O'Nora can only watch from behind. Answer: Fortunately, the MLB Umpire Manual interprets Rule 5.01(b) (which pertains to an umpire calling "Time" and the ball becoming dead) in the following fashion: "If a batted or thrown ball inadvertently goes inside a player or coach's uniform (or lodges in the catcher's face mask or paraphernalia), the umpire shall call 'Time.' He will, using common sense and fair play, place all runners in such a manner that, in the umpire's judgment, will nullify the action of the ball going out of play. In no case may any outs be recorded on such a play." Thus, because batter Barnes' line drive appeared to inadvertently go inside pitcher Pivetta's uniform prior to Pivetta getting secure possession of the baseball in his hand or glove, the MLBUM interpretation shall apply: the ball is dead and no out may be recorded. By rule, the batter—because he has become a runner by virtue of hitting a fair ball—must be placed at one of the bases: most likely at first base, and credited with an infield single. The discretion afforded to the umpire by a "nullify the act" clause is expressly qualified by the statement, "In no case may any outs be recorded on such a play." This is not a situation in which the player may retrieve the ball before "Time" is called so as to nullify its effect and keep the ball alive: the ball is dead immediately upon its entry into a player's uniform. Why This Call Was Missed: As diagramed on the above graphic taken from the mid-home camera angle in the press box, plate umpire O'Nora was, obviously, at home plate as the line drive reached Pivetta. As captured on the image at the beginning of this article (and the thumbnail featured in the video, below), Pivetta spun around so that he faced center field as the ball entered his jersey: O'Nora from his position at home plate could not see how the ball came to rest in Pivetta's possession, since Pivetta's back was to home plate. Pivetta retrieves the ball from his abdomen. 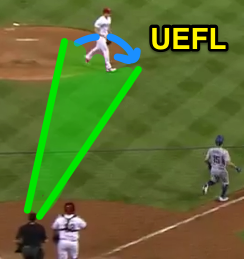 The two umpires with potential knowledge of the ball-into-uniform property of this play are the first and second base umpires. Due to Pivetta's speed in spinning toward center, and his right hand obstructing a view of the jersey, 1B Umpire Paul Emmel may not have had a clear look at the middle portion of the play (after the ball entered the jersey), though he may have been able to see the aftermath as Pivetta spun back toward first base while simultaneously retrieving the ball from inside his uniform shirt. Then again, Pivetta's sleight of hand may have similarly obstructed the view. 2B Umpire Chad Whitson, however, would have had a glance at a ball-sized bulge underneath Pivetta's jersey, though he would likely not have seen the ball actually enter the uniform top. Recall, however, that the second base umpire, with no runners, is stationed in shallow center field. It thus stands to reason that he similarly would not have had an entirely convincing look at the ball underneath Pivetta's jersey due to the time and distance associated with this play. Finally, a white ball with red stitches underneath a white uniform with red pinstripes may have certainly played the role of chameleon to Philadelphia's advantage. In all, with no umpire having seen the ball enter Pivetta's jersey, there was no conference and no detection—by anyone on the playing field, including Barnes—of the ball in the player's uniform.